Applications forms for Gaeltachta Scholarship 2014 are now available either in our clubrooms or by emailing: secretary.castlewellan.down@gaa.ie or secretary.castlewellan.down@gaa.ie. Please note all applications must be returned to the County Office before the closing date of Wednesday 30 April at 5pm. We are advised any Applications submitted after this date and time will not be considered writes Martin McClean. 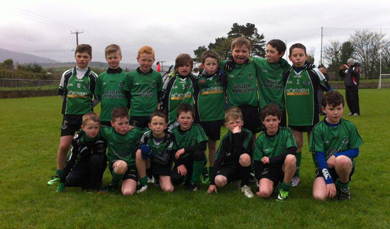 The Under-10’s pictured at their blitz in Castlewellan. This weekend was a busy one for some of our youngest juvenile members. On Saturday morning our under 10 footballer’s took part in a football blitz in St. Malachy’s Park against Drumaness, Bredagh & Carryduff. The boys performed strongly in all their game’s and had some fine displays throughout the panel – well done lads from all your coaches. A big thank you to all the parents whom provided assistance on the day. Well done and hard luck to Matthew McCabe, representing St Malachy’s P.S. Castlewellan, who narrowly lost out finishing second to Francis Caldwell of Ballycran in the Primary schools Féile skills competition. After the initial competition the lads were tied and two tie breakers were required to decide the outcome. Unlucky Matthew! We will be placing an order shortly for juvenile hurling sticks. These will be light with a good size bas and it is important that our young players have the correct weight and length of stick to develop the skills of the game. They are £14 and orders and payment are to be made by the 29th April to Martin Keown or Aidan Rodgers. There will be no under-10 & Under-12 hurling training on Easter Monday 21 April. The senior ladies and men’s footballers started their seasons well with good wins away to Annaclone and Loughinisland respectfully. It is always nice to get a good start in the competition. The Senior footballers have organised a Garth Brooks Tribute night in the club on Saturday 3 May 2013. Get your tickets from any of our senior players.